From New Jersey to Long Island, from Northern suburbs to the Atlantic Ocean, with all of New York City in-between. 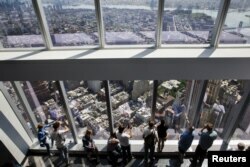 That view became available to the public Friday as the One World Trade Center Observatory opened in New York - atop the replacement for the buildings destroyed in the September 11, 2001, attacks. The emphasis was on New York, the future…but still remembering the past. People from around the world lined up to go to the top of this shiny new building, which reaches 541 meters into the sky…taller than any other building on the North American continent. Construction was completed at the beginning of this year…it took several years to build, with 45,000 tons of steel, 159,000 cubic meters of concrete, resulting in a total of nearly 28,000 square meters of office space. And today, the latest tenant opened up for business, One World Observatory. “We’re back. You hear this. You heard this from construction workers. We’re back. We put this building up," said Dave Checketts, chief executive officer of Legends, which operates the Observatory. The Observatory covers three floors - from 100 to 102. But first, there's a 47-second elevator ride featuring time lapse video - depicting the development of New York and ending with a panoramic view of the region as it appears today. Stepping off the elevator, visitors watch another video featuring those who helped build World Trade Center 1, also known as Freedom Tower. Then comes the final treat - Manhattan and beyond as far as the eye can see. On a clear day, that means approximately 80 kilometers in all directions. Visitors to the newly opened One World Observatory in New York, May 29, 2015. Back on the ground - the official ribbon-cutting - to open the experience to the public. It costs more than $30 for an adult to take in the view. But that was not on the minds of the first day's visitors. “It’s very impressive, so high, excellent,” a visitor from Germany said. “Our country helped build this tower because the steel girders in the basement of the tower are coming from my country," said a visitor from Luxembourg. "So, you see that the smallest country of the world has helped the mightiest city of the world. One of the principals in Legends is the owner of the Dallas Cowboys, Jerry Jones, who summed up the feeling of many who remember September 11, 2001. “This is called getting knocked down and getting back up, which is what we think of ourselves in this country," he said. The Port Authority of New York and New Jersey is guaranteed $875 million in revenue from the observatory over the next 15 years….and part of that return started today. But more important, perhaps, was seeing the new World Trade Center as a place of remembrance and hope for the future.